Operators needing to upgrade their CPCS Red Trained Plant Operator Card, or Operators who wish to go direct to a CPCS Blue Experienced Operator Card, have to complete the above qualification in order to gain the CPCS Blue Experienced Operator Card. 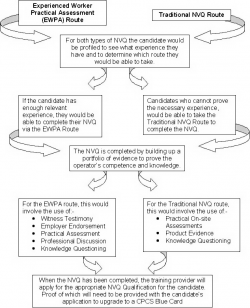 There are two routes to be able to complete the NVQ Qualification specific to the category(s) on the Operator’s card. Please find below a list of the various NVQ Qualifications that DLT Training Ltd can offer.